Offshore aquaculture: fruitful promise or the next hype? By 2030, the world population is estimated to reach around 8.5 billion people and then grow to around 9.7 billion people by 2050. With this growth, demand for protein (vegetable, meat and fish) is also increasing significantly. Although about 70% of our earth is made up of water, the sea currently provides us with about 5% in our food supply. Availability of land is becoming increasingly scarce and accelerated growth in agricultural production is increasingly under threat due to climate change, land depletion, limited stocks of phosphate, changing consumption patterns, etc. Meanwhile, fishing is also reaching its limits. In order to feed the growing world population, alternatives need to be sought. Aquaculture is seen by many as indispensable in order to meet the need for protein in the future. 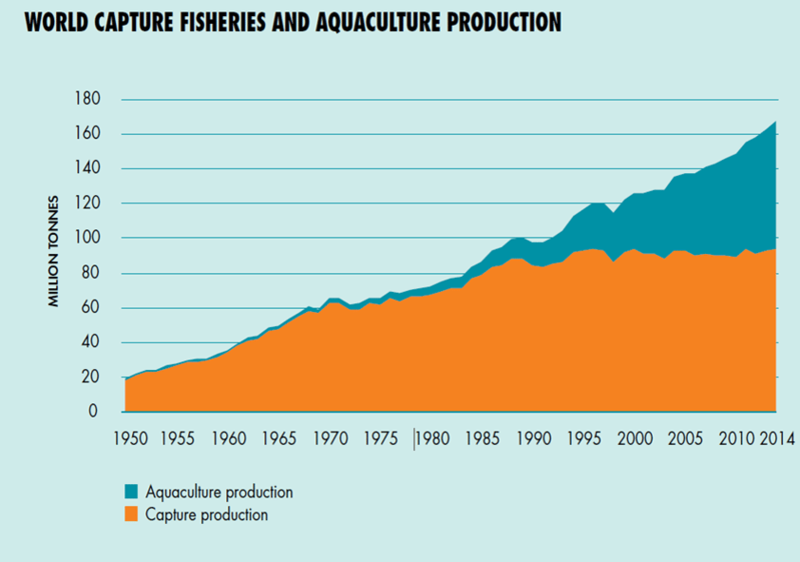 In order to continue to feed the population, aquaculture will have to double over the next 15 years. This can be done in the form of fish farming, but also the cultivation of seafood, algae and seaweed. In addition to scarcity, sustainability is an important driver. A part of the world’s population is willing to spend more on food if it is produced in a sustainable manner. For example, spending on sustainable food in the Netherlands increased in 2015 to 15%. In addition, chains like Whole Foods (recently acquired by Amazon) show that there is an increasing demand for sustainable/organic food. Offshore cultivation of fish is still in its infancy, but offers opportunities if there is a long-term focus. Due to the relatively high yields, the current cultivation focuses on salmon. Salmon is grown in the waters around Norway, Scotland and Chile. The further development and professionalization of offshore aquaculture entails a high investment requirement. New concepts for further offshore breeding of fish are already being considered. Currently, there are only start-ups or recently released plans that are including these new concepts. One example is Ocean Farming AS, a subsidiary of SalMar Group, which combines technologies from fisheries, fish production and offshore industry. The purpose of this technology is to further cultivate 1.5 million fish per year. The plant is currently under construction in China and is expected to be installed in the second half of 2017. An advantage of further offshore cultivation of fish is the reduced chance of sea lice. Sea lice are parasites that are located in water close to the coast (Norwegian fjords / Scottish lochs) and can adhere to the skin of salmon. There is a risk that a (large) part of the harvest will be lost unless antibiotics are administered. However, this is undesirable. The further offshore cultivation of fish largely counteracts the problem with sea lice. A disadvantage of further offshore breeding of fish is the higher transport costs. These costs must be made for transportation to and from the nursery, but also for the supply of food. This means that offshore aquaculture can only be successful if it can add high quantities of fish and if the trend towards sustainable food continues. In addition to cultivating salmon, the cultivation of new species, such as tuna, may eventually be lucrative and bring opportunities in the field of multifunctional utilization of offshore wind farms. One can think of seaweed cultivation combined with offshore wind. Pilot farm Scheveningen, an initiative of the North Sea Farm, is located 15 kilometres from the Scheveningen coast. The aim of the test farm is to investigate how seaweed cultivates in the North Sea. So far, it appears that the seaweed has developed very well. In May 2017 more than 100 kilos of seaweed were harvested. A next step could be integration into an offshore wind farm. These developments provide opportunities for a variety of companies, including suppliers in the maritime and offshore sectors, but they also entail new risks. 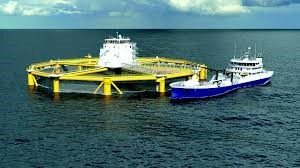 Under the influence of the low oil price, the offshore oil & gas industry goes through a difficult period, which means that companies are looking for alternatives. Offshore wind is an important alternative. However, companies are increasingly looking at offshore aquaculture. The high development costs and a different earnings model then used in offshore oil & gas (lower yields) show that many suppliers are reluctant to commit themselves. Currently, only a limited number of suppliers in the offshore industry and offshore service companies are active in offshore aquaculture. Important players include Damen Shipyards with various products tailored to offshore aquaculture and Norwegian parties such as Farstad Shipping and Kongsberg Maritime. Offshore aquaculture offers plenty of opportunities for the future. On the one hand, because the world’s population continues to grow explosively, land scarcity is increasing and solutions near the coast can pose problems. Next to that, it could also offer new opportunities due to the growing demand for sustainable food. A potential disadvantage of offshore aquaculture could be the higher costs. Nevertheless, the development of offshore aquaculture activities can provide a more balanced portfolio of suppliers to the offshore industry. For example, peaks and falls in the oil and gas market can be better absorbed. However, offshore aquaculture will only be successful if we are willing to pay more for food. Offshore aquaculture is still in its infancy and there are plenty of opportunities for parties to profile themselves in this segment. The first initiatives are evolving and the interest of offshore companies is increasing. All in all, it is important for suppliers to the offshore industry to grab.